What are Air Classifiers and how do they work? Air Classifiers are industrial machines which are used to separate materials by size, shape, and density. By using forces - such as air drag, gravity and centrifugal force - they sort fine particles from coarse particles and lighter particles from heavier ones. While density does play a role, the air classifier separation process is mainly dependant on the mass and weight of the particles. So how do they work? When a feed of material enters the Air Classifier’s chamber, they encounter a column of rising air. The air drag then creates an upward force, counteracting with gravity, to lift the materials into the air. This allows the objects with varying physical characteristics in the air column to be sorted and moved into different regions, with the heavier particles naturally falling to the bottom of the chamber. An Air Classifier is commonly used on an industrial scale when particles are too fine to be screened or the capacity is too large. An example of this is a recycling center where various types of plastics, paper and metal have to be divided in order to be processed. 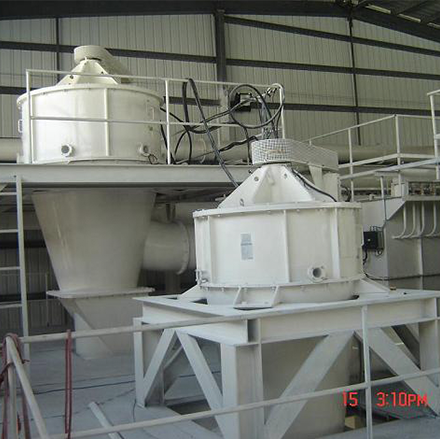 They are also used to sort materials such as chemicals, foods, minerals, cement, fly ash, gypsum, quartz, silica, sodium bicarbonate, varnish and bentonite. Ait Classifiers can also be combined with impact grinding equipment to create an Air Classifier Mill. The mill uses airflow to convey feed material to the mill’s grinding chamber, segregate the material into fine and coarse fractions, recirculates the coarse material for further grinding and moves the fine particles out of the mill.Simply put, the intelligently engineered Air Classifier acts as a mini segregation factory. What issues can affect Air Classifiers? Primasonics Acoustic Cleaners are the most efficient way to combat Air Classifier issues. Blockages: Blockages in the vents can affect the feed rate with the material-to-air-flow having a dramatic effect on efficiency. If the Air Classifier is not properly vented or controlled with fine water spray, dust can gather in outlet areas. Surface moisture content: Moisture is another factor than can disrupt the efficiency of an Air Classifier. If the moisture content within the chamber is higher than 1.5%, the finer particles can start clinging to the larger ones. This compromises the quality of the classification. When the moisture content from rainfall or dust spraying is high, the water is centrifuged out, resulting in equipment clogging. Excessive Vibration: Issues with Air Classifiers, such as the above, can lead to excessive vibration which compromises the classifier’s structural integrity. Too much vibration will also put additional stress on the gear unit bearings and seals. Climate: Extreme climate changes and moisture effects are issues that can affect Air Classifiers. When temperature fluctuates from day to night, higher wall stresses are created. If the problems are not dealt with and the ware on the machine is continuous, the consequences could lead to problematic results. How can Air Classifier issues affect production? Several complications - including poor maintenance and the issues mentioned above - are factors that can disrupt an Air Classifier and site’s production. When not maintained to a high level, these issues could result in plant shutdown and loss of production. Accuracy: When an Air Classifier is running at it’s best, it can deliver accurate particle distribution ranging from the heaviest to the ultra fines. It can also process a wide variety of materials, some which are difficult to handle, without generating potentially damaging increases in temperature. Air Classifier issues can affect production across a range of different industries. In previous year, manual cleaning where a person would have to enter the machine, was the only method of cleaning Air Classifiers. But this was a time consuming and potentially dangerous task. The development of Acoustic Cleaners, however, has changed things - forever and for the better. In comparison to manual cleaning, Acoustic Cleaning is a safe, inexpensive and convenient. It is a way of maintaining your industrial equipment without interfering with the site’s production levels. How can Primasonics Acoustic Cleaners help prevent Air Classifier issues? Being a non-intrusive technology, Primasonics Acoustic Cleaners create a series of high energy-low frequency sound waves. The aim is to penetrate material build up with rapid pressure fluctuations and provide a long term solution to Air Classifier blockages and buildup issues. Using alternating frequencies, Primasonics Acoustic Cleaners are able to target particles that have different masses and which therefore travel at different speeds. This causes compacted materials to vibrate at a different rate to their surrounding environment. The particles are instead detached from surfaces and carried along by the gas stream to a suitable filtration. Primasonics Acoustic Cleaners are the most efficient technology to deal with Air Classifiers. What are the benefits of using Acoustic Cleaners? Preventative: Unlike manual cleaning which was employed after a serious issue had occurred, Primasonics Acoustic Cleaners can be used to ensure that the machine’s efficiency is preventing harmful build up. Rather than dealing with the issue after it has progressed to a problematic stage, Acoustic Cleaners ensure that Air Classifiers are consistently performing well. Non-intrusive: Acoustic Cleaners are designed to reflect sound from solid surfaces. Therefore, the powerful sound waves that they transmit will only penetrate targeted materials and not the chamber walls. This will prevent structural damage and the propagation of wear. Health & Safety: In addition to the elimination of costly and dangerous manual cleaning regimes, Acoustic Cleaning is completely safe. By using the latest and safest remote cleaning technologies, there is no risk to a person’s safety. No down time: The service does not require down time on site and will operate during normal working hours. Quality: By employing Acoustic Cleaners, accurate segregation is achieved within the Air Classifier chamber and particle distribution is made easy.